Three percent cash back and $59 a year are among the terms of Alliant Credit Union’s new credit card offering. A new credit card program at Alliant Credit Union offers no-limit cash back. A $59 annual fee has not deterred retention. Alliant Credit Union ($10.3B, Chicago, IL) has put its signature on a high-rewards credit card it figures can compete against the best the big banks have to offer. And don’t bother asking to waive the annual fee. The Alliant Visa Signature card offers 3% cash back on all purchases and no fee in its first year. After that, it’s 2.5% for all purchases, with no limits, and a $59 annual fee. Some of those first-year users are now reaching their second year, and the big Chicago credit union is declining requests to waive the fee. Indeed. The targeted user of the Signature card charges at least $50,000 a year, which equates to cash back of at least $1,500 in the first year and $1,250 thereafter. As for the fee, Goeppner says the credit union must be careful in waiving fees because doing so could suggest favoritism, and the credit union has passed the $10 billion mark that puts it under additional scrutiny from the CFPB. A year after its launch, Alliant is now pushing its Signature card and 3% payback beyond existing members to bring in new ones. “We know people aren’t used to fees in credit union land, but we couldn’t waive it if we wanted,” Goeppner says. That’s because the competitive cash back feature necessitates a fee, and Alliant’s $59 fee is well below the $95 average for similar cards like Chase Freedom Unlimited, AmEx Blue Cash Preferred, Discover It, and Citi Double Cash. The Alliant website includes a comparison chart with those cards. Some of them don’t have annual fees but do have various conditions and restrictions that the newest Alliant card avoids. Alliant strategists crafted the card to fill a gap identified by members and confirmed in market research: the need for a true cash-back rewards card with no complications. The Signature card is now one of three offered by Alliant. The no-frills Platinum card has no fee or rewards but does offer an introductory rate as low as 0% for the first year. The Platinum Rewards card also is fee-free and offers the low introductory rate as well as rewards in the form of cash back and points toward travel, merchandise, and charitable contributions. Alliant varies the themes in its banner ads for its high-rewards Signature credit card. 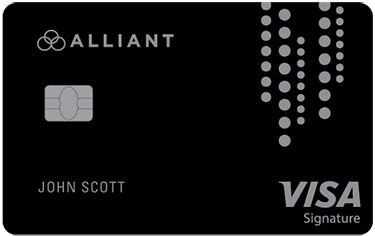 Alliant added the cash feature to its Platinum Rewards card in 2016 and raised it from 1% to 2% last year as part of the same thinking that led to the creation of the Signature card. 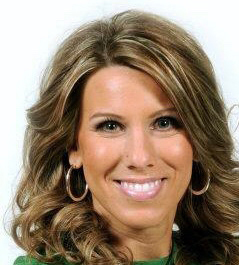 That market focus helps Alliant strategists think outside the echo chamber and design products that members will use. Alliant soft-launched the Signature card in March 2017 to employees and members who found it on the website. A few months later, Alliant pushed it to members who might be interested in an upgraded card, such as members who were not using the Platinum cards and fit credit score, income, and spend criteria. 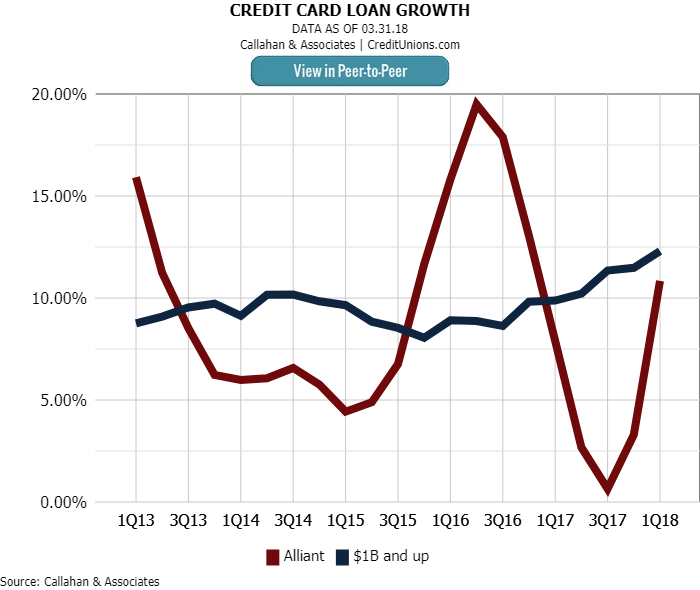 Credit card loan growth has spiked at Alliant since the launch of its new Signature credit card. The data in this article is pulled from Callahan’s Peer-to-Peer. Callahan Analytics can help your credit union benchmark performance. Learn how today. Nearly 10,000 people have signed up for the Signature card so far, and 87% are averaging 50 transactions a month. They’re part of a portfolio that also includes a little more than 43,000 Platinum cards and 27,000 Platinum Rewards cards. That activity has helped Alliant grow its total credit card balances by 10.83% in the year since the Signature card launched, from $163.9 million in the first quarter of 2017 to $181.70 million as of March 31, 2018. The portfolio also performs well, with a first quarter delinquency rate of 0.82%, compared with the 1.31% average of credit unions with $1 billion or more in assets, according to data from Callahan & Associates. Up next for the Signature program is merchant-funded extra paybacks. According to Goeppner, that research-based feature will pay above the base 2.5% at varying rates. One thing will remain the same, however.